RING - SARAH COVENTRY. "SEA GODDESS" FROM 1967. 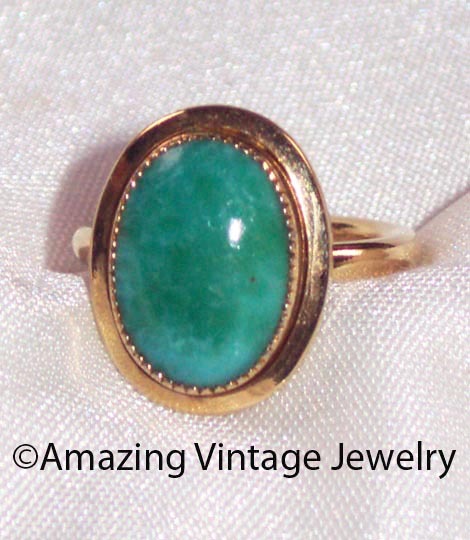 GOLDTONE FRAME WITH A SEA GREEN INSET. RING TOP IS 3/4" LONG, 5/8" ACROSS. ADJUSTABLE FOR SMALL TO MEDIUM-SIZED FINGERS. GOOD CONDITION WITH A LOT OF WEAR TO THE BAND - HARD TO SEE WHEN WORN. PRICED ACCORDINGLY.